National RF’s 75-NS-3 receiver is a complete super-hetrodyne mini high frequency receiver, designed specifically for the short-wave listener, electronics enthusiast or radio amateur, who wants to use their hands and build a radio. 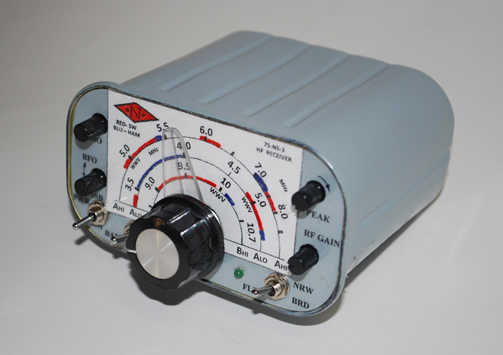 The receiver is offered as a semi-kit in which the electronic assembly is loaded and functionally tested at the National RF facility. The customer must then go to the grocery store (yes…the grocery store! ), procure a can of lunch meat, eat it or give it to the dog, and then proceed to drill and paint the can, in order for it to become the receiver’s enclosure! As the name of the preferred potted meat can has a registered trademark by Hormel Foods, Inc., it won’t be mentioned on this web-site. However, the name of the product is synonymous with unwanted email!!! In addition, there are other food products that might be found that are packaged in the same metallic enclosure. Detailed drilling instructions and final assembly instructions are provided as part of the kit. All other parts required for completion of the receiver are provided as well. 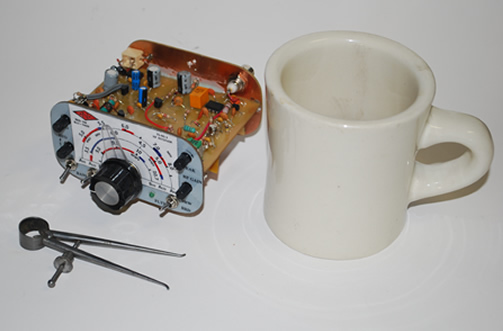 Recognizing that the finished assembly looked somewhat like the fabled Collins receiver of the ‘60s, the 75S-3, (particularly when the can is painted a light gray) National RF engineers dubbed it (with tongue firmly planted in cheek, of course) the 75-NS-3! Although we have had fun packaging this receiver in a lunch meat can, it is nothing to turn your nose at! Its performance and portability will surprise you, and it is an ideal radio to bring with you on any trip! The receiver architecture is that of a single conversion super-hetrodyne receiver, that is capable of receiving AM, SSB, or CW. 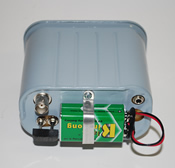 The receiver incorporates a dual gate FET as an RF amplifier with manual peaking and gain controls. 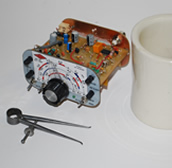 A ceramic filter is used in the IF section with a front panel switch that controls a broad or narrow IF response. Other front panel controls include audio drive, BFO setting, and a band switch for the HF bands. 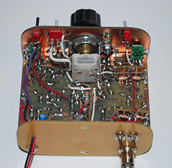 The 75-NS-3 has internal receive frequency coils that are switched at the front and rear panels. The frequency range of the receiver, over three band set positions, is 3.5 through 12 MHz. 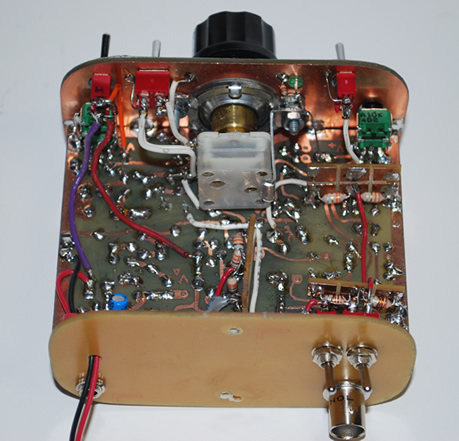 This allows reception of several international short-wave bands, the 80, 60, 40, and 30 meter amateur radio bands, and of course, WWV time and frequency standard stations at 5 and 10 MHz. 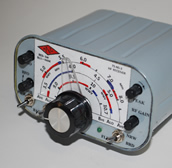 For those who simply want a lower cost receiver to monitor the shortwave frequencies, National RF offers two variants of the original receiver: the 75-NS-1 and the 75-NS-2. Both are based on the design and circuit of the 75-NS-3, but do not have the band switching and frequency range of the 75-NS-3 receiver. The 75-NS-1 covers between 3 and 6 MHz, including the 80 and 60 meter amateur band. The 75-NS-2 covers between 6 and 12 MHz, including the 40 and 30 meter amateur bands. Both units have the fixed ceramic resonator band width set for about 6 KHz. And, of course, they are both designed to fit in the tasty potted meat can!! All other specifications presented apply to both of these models as well. 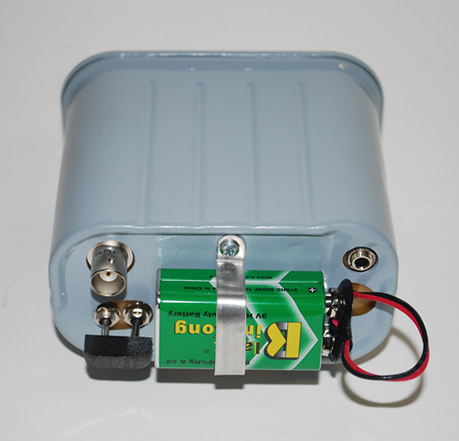 75-NS-1 covers 3 to 6 MHz. 75-NS-2 covers 6 to 12 MHz. 75-NS-3 is band switched from 3.5 through 12 MHz in three switched positions. Sensitivity: Minimum Discernable Signal (MDS): Approximately -107 dBm (1 micro-volt at 50 ohms), with receiver in CW/SSB mode. Input level for +10 dB Signal to Noise response (SNR): Approx. 5 micro-volts (-94dBm) Measurements made at 10 MHz on the engineering development prototype receiver. Rear Panel: RF Input BNC, Audio Output jack, Hi-Lo RF Switch (75-NS-3 only), 9Volt Battery connector, Battery Mount. Power: Either a 9 volt Alkaline or Lithium battery recommended. Battery mounted on rear panel. As previously stated, the main circuit board is assembled at the National RF facility and is tested for functionality prior to incorporation into the kit. For working the lunch meat can, a drill press is desirable, but a hand electric drill will work as well with care exercised. In addition, as the lunch can aluminum is extremely thin, a set of small files may be necessary to work the enclosure. Rotary files that can be chucked-up in the drill press are recommended for bringing the holes to their finish dimension (3/8 inch to just under ½ inch). As the can aluminum is so thin, we recommend not drilling past ¼ inch diameter holes, as the aluminum will tear on larger diameters and the enclosure may be bent severely, as well as possibly cutting yourself on the sharp torn edges. Hence, the use of rotary files is nearly necessary for a clean, professional job. Also, the customer must have an appropriate soldering iron in the 30 to 50 watt range, with a fine pointed tip, and suitable pliers, wire cutting tools, and screw drivers, used in the assembly of electronic hardware.